Scattering the ashes of a loved one into the ocean can be an extraordinarily beautiful way to say goodbye. Many people love the idea of the ocean teaming with life. Many of our requests are related to the ocean, the whales and/or the wildlife having been a special place of significance to the deceased. 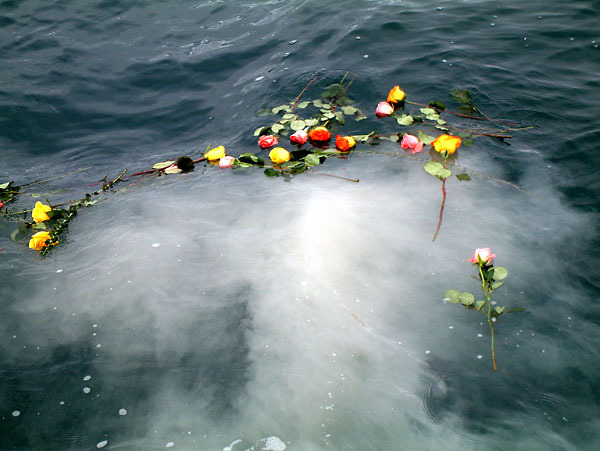 While an urn is not required, in fact most people don’t use one and simply scatter the ashes overboard we do recommend using biodegradable urns when an urn is used. It is also nice to watch the urn drift near the boat amongst the flowers and then eventually disappear beneath the surface. One of our charters even made their own paper "boat" which sank after about 5 minutes. One of the nicest accompaniments (extra cost) is a bagpiper - let us know if this interests you and we’ll put you in touch with a local bagpiper who you can contract directly.